"Very simple to make and kids love it!" In a medium skillet over medium-high heat, cook beef with onions until brown. In a large stock pot cook potatoes, until tender, in as little water as possible, about 20 minutes. 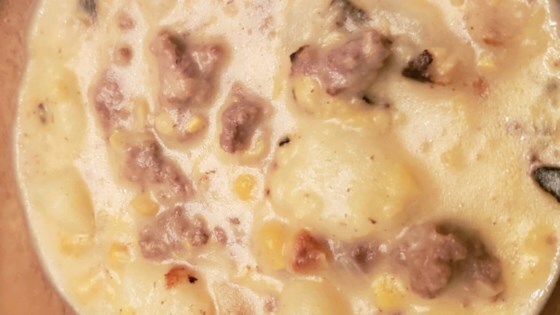 Add creamed corn, undrained corn, milk and beef mixture to potatoes. Simmer for 30 minutes and serve. Super Bland, easy to make, just needs a lot of flavor, would be easier to start with a different base and make stew or soup.